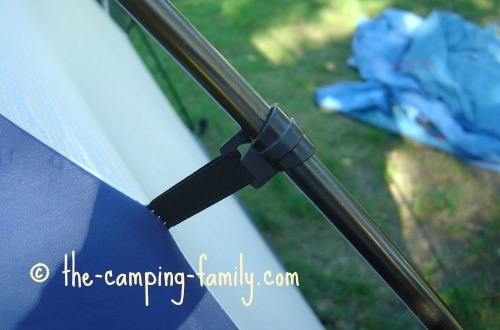 Be sure to give some thought to the camping tent poles before you purchase a tent. You might think that one tent pole is much like another. Not so! Choosing good tent poles is important. A good set of poles with an easy-to-use installation system will make putting up your tent an easy and enjoyable experience. A poor set of poles, on the other hand, can make pitching your tent a nightmare. Here's what you need to know to make an informed choice. Some of the cheapest tents on the market have fiberglass poles. 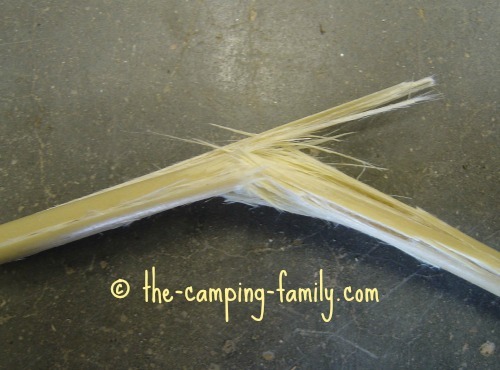 Fiberglass camping tent poles are the least durable option. They break easily, leaving sharp shards of exposed fiberglass. Don't touch this stuff!! The tiny glass particles can work their way under your skin, causing an itchy red rash. 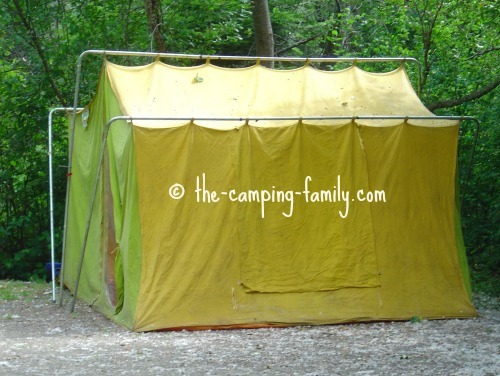 My children once had a small play tent that had fiberglass poles. I can't count the number of times those poles snapped. 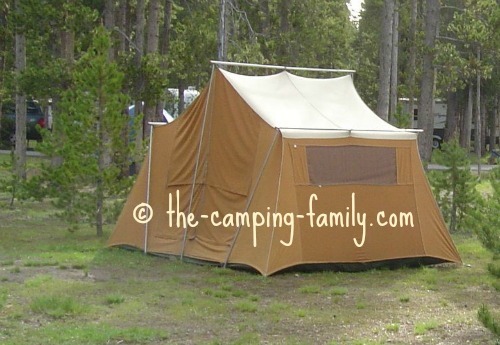 I would never buy a camping tent with fiberglass poles. I like to have my children help set up our camping tents. I don't want to worry that their enthusiastic efforts are going to break a pole. By the way, it is possible to repair a fiberglass pole. You'll need sandpaper, fiberglass mat and resin - and lots of time, patience and skill. Fiberglass pole repair definitely isn't something you want to do in the middle of a camping trip! Take my advice: don't buy a tent with fiberglass poles. 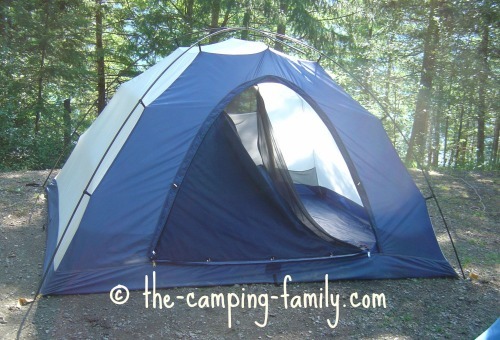 Most smaller, good quality tents have aluminum tent poles. 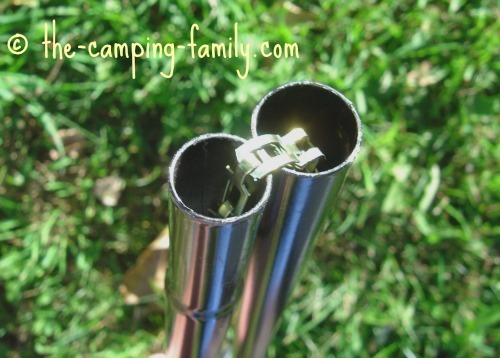 Aluminum camping tent poles are durable. They won't break under normal use. If someone is roughhousing in the tent and falls heavily against a tent wall, an aluminum pole might bend - but you'll probably still be able to use it for the rest of the trip. If it is too bent to be usable, you might be able to bend it back carefully into shape. It's a good idea to pack a tent repair kit like this one. In the unlikely event that an aluminum pole does break, you'll be able to do a quick repair and continue to enjoy your trip. Canvas tents and large, multiroom nylon tents are heavy. Many come with heavy steel poles that can support their weight. 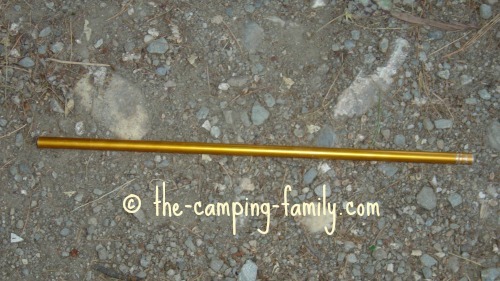 Steel camping tent poles are very durable. 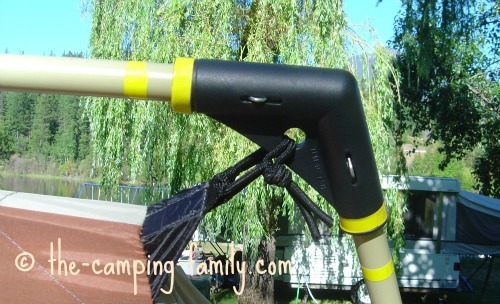 Carbon fiber camping tent poles are the strongest, lightest and most durable option. Of course, they are also the most expensive. They are found only on high-end backpacking tents. Unless you are planning to do extensive backpacking and need an ultralight system, you won't need anything this pricey. 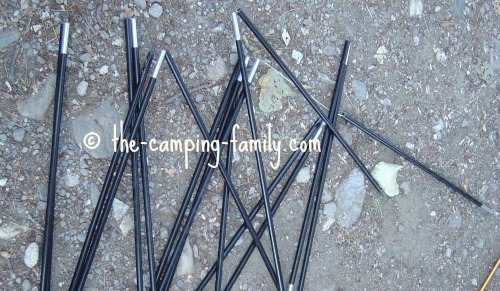 Tent poles come apart for transport and storage. 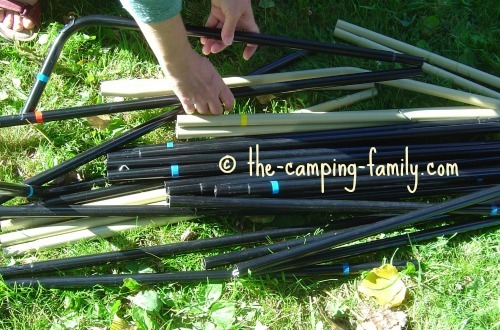 Before you can put your tent together, you'll first have to put the poles together. The tricky part is making sure that you put the pieces in the correct positions! Some pole systems are color coded to make this easier. Just match the colors, and you can't go wrong! Others are linked together so you can't possibly put the wrong pieces together. Here's a chain link system. I like the elastic shock cord system. These poles are attached with a strong, stretchy cord. What if the cord breaks? I've never, in 20+ years of tent ownership, had a shock cord break, but I've heard that it can happen. Take the pole back to the store and ask them to repair it for you. You'll have a better chance of success with tent pole repair if you bought your tent from a reputable outdoor store. Buy a replacement shock cord. Again, a good outdoor store will stock these and will be able to tell you how to do the repair. I've heard that it's a fairly easy thing to do. Buy replacement tent poles. Be sure that you get the correct pole! Again, a respected manufacturer will be more likely to stock replacement parts. If you buy a cheap model from the discount store, you'll probably be out of luck when you try to buy a replacement pole that fits. Once you've gotten the poles together, it's time to set them up and attach them to the tent. There are a number of different ways to do this. Some tent systems require that you thread the pole through a long sleeve. This can be a frustrating procedure - especially if there are many poles and many sleeves. Unless you are extremely careful, the pole tends to get snagged on the sleeve. Then, as often as not, the pole sections come apart! You have to pull the pieces out of the sleeve, put them back together, and start again. I find that a system of loops is easier to use than a sleeve. Since you thread the pole through a series of loops, there's no chance for the pole to get snagged. This is my favorite system. First you lay the tent on the ground. Then you set up the poles. Next, you clip the tent to the poles. Some tents use a combination of these systems. This tent has both sleeves and clips. As with most things in life, you get what you pay for. 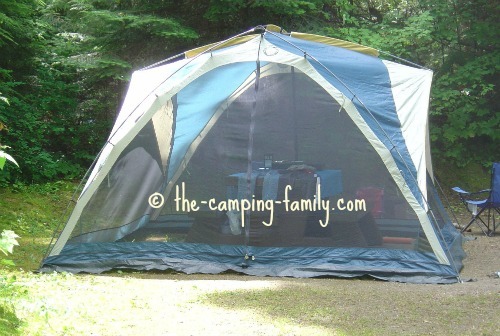 A good quality tent with sturdy, easy-to-use poles will cost more than a tent with flimsy, frustrating poles. 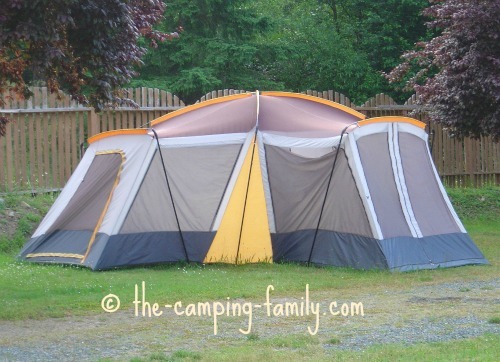 Now that you know all about camping tent poles, click here to learn more about tents. 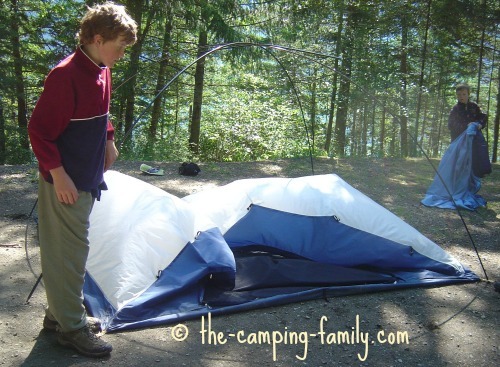 Once you've purchased your tent, you'll need to know how to set it up. 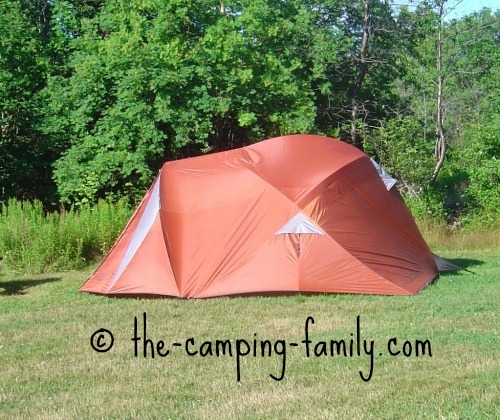 Visit this page to learn all about pitching a tent. 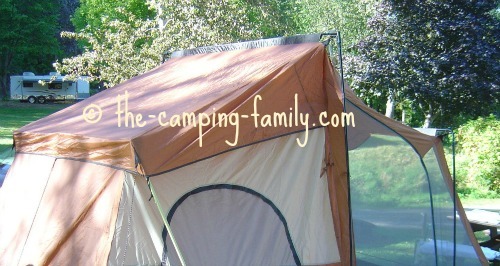 For information on all aspects of your next camping adventure, visit The Camping Family home page.